Beautiful log home with timber frame bordering National Forest land. 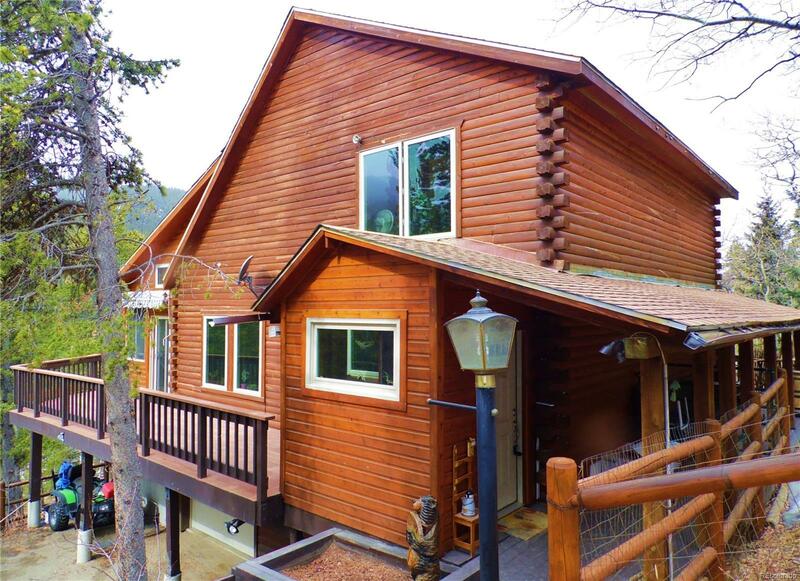 Wraparound deck features Continental Divide views! Vaulted ceilings, Updated kitchen, Updated bath, Open, sunny floor plan, Heated solarium with hot tub. Master bedroom has vaulted ceilings, mountain views & W/I closet. Upper loft could be converted to 3rd bedroom. Walk out basement features a wet bar & game/family room, laundry with 1/4 unfinished bath ready to become a full bath. Lower level game room could also be a private bedroom & has egress. Main level sitting room could also be converted to a bedroom. South facing with year around maintained county road makes for an easy commute (20 min to Evergreen, 45 minutes to Denver). Take Squaw Pass to Evergreen/Denver or Hwy 103/Soda Creek to Idaho Springs. Enjoy Historic Mtn towns, Hiking, 4 wheeling, Biking & Ski Echo Mtn, 7 min, Ski Loveland 30 min.